The key to so many situations is to just be okay with who you are. I don't always manage it, but on the few occasions where I have it has been the most freeing and lightening experiences in my life. The ability to just accept and love yourself in the face of the overwhelming evidence that life provides you of your imperfection is a talent. Perfection arises from imperfection. If you find yourself berating yourself take a breath. View the video above as often as you feel you need it. Coming out of the holiday season we can all be a little worn out from stress of trying to create the "PERFECT XMAS" or whatever holiday you celebrate. Movies, televisions, and books have painted an illusion that at this time of year we are able to be more open and compassionate. Often times we are so stressed from trying to make everything perfect that we can forget the most important thing which is to cut ourselves and our families some slack. I too have been guilty of expecting others to behave in a certain way for "the holidays". I tend to be more judgmental of myself about how my body looks, how successful I am, or how well I am liked. I also notice when I am treating myself this way I tend to project that onto others. That's not exactly the holiday spirit I want to convey. In light of that it is extremely important for me to remember what is going right and to honor that. One of my prayer practices is to say after meditation " I pray beauty into my heart, I pray beauty into my mind, I pray beauty into my body, I pray beauty into my relationships, and I pray beauty into my work." Take time to honor yourself this winter, to reflect on what is right with life and the world. A billion processes must be working flawlessly for you to continue breathing each second. There is beauty to be found in winter's heart. I've been rather remiss in posting lately, and much has been going on in my life. You would think that would lead me to post more often, but alas no I mean to and yet somehow the next thing happens. One of the most interesting experiences I come across is to see how others view me. I had no idea that many people in the community were completely unaware of my ceramic production. This was hammered home to me when I took some of my work to the Sound Light and Ascension Expo the last weekend in September. I had a booth sort of fall into my lap at the last minute, and when I checked in with my guidance I was told to bring "my whole bag of tricks". 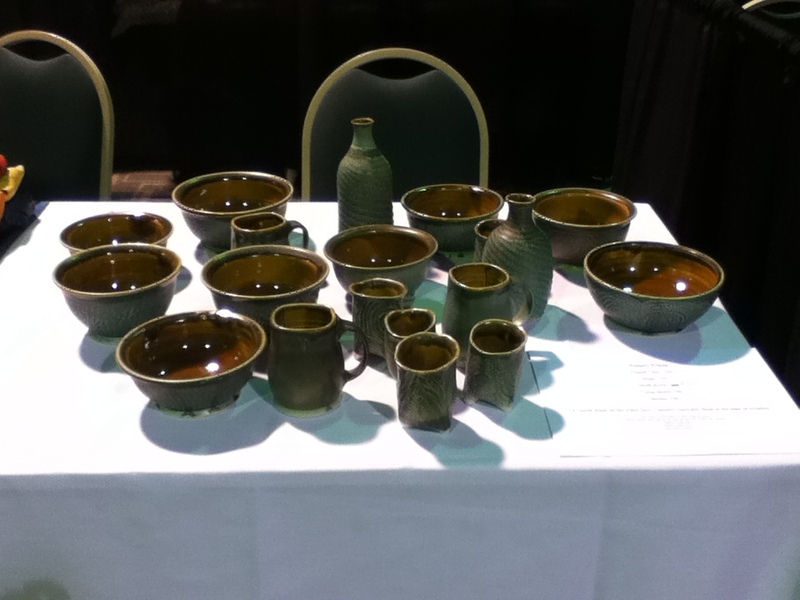 So I finally brought some of my ceramic wares to sell, and sell they did. The most common thing I heard was "you made these?" Usually followed by a compliment to my skills. I should let you know dear reader that I only brought the best of the lot(in other words there were some pots that didn't make the cut). The event went well for me both in pottery sales and in readings. One of the things I had been told repeatedly by spirit guides was that I needed to make space for client sessions. So I finally put it on the calendar and made it official. I have opened up an hour on Wednesdays (9:30 - 10:30 PM) for remote energy shifting/clearing sessions. This isn't the only time I am available, but putting a specific time down was a symbol to the universe that I am ready and making space. Within 24 hours I had a new client. Another recent event I worked at was the Gypsy Night in LaGrange this past Thursday. I got to connect with a few new people, and once again was reading in the toy store. It wasn't the most visible location, but I like the energy in there. I'm still a kid at heart, and sometimes I even get mistaken for one(thank you to the man for carding me at the movies a few months back it really gave me a laugh). So I think this is nice and at the same time all this success all at once after a long and what seems like painfully slow build up is rather overwhelming. I even feel myself trying to step back from it. I've done this repeatedly over the years, but this time I have decided to just say "yes" to opportunity. I know a lot of you readers do this too. You don't know how to take a compliment or an opportunity. Learning to be okay with things going successfully takes practice. I am willing to practice now though, even if it is a little anxiety provoking. Anytime we reach one of our limits we can feel a bit nervous. New doors with new possibilities, we always seem to wish for them and when they show up well we don't want to go through them because we don't know what it will be like on the other side. So just like you dear reader I ask for change and then get a little scared of it (okay sometimes more than a little scared). What I am starting to realize is that it is okay to be scared or nervous about all the opportunities knocking, but I am resolved (and I hope you will be too) to start answering the door more often. Well it has been an eventful summer thus far. It's been a reversal of my normal pattern. I generally travel to do workshops and then come back home and apply them. This summer the training I've taken has been locally grown, and I have travelled to apply what I've learned. I can't tell you how much it means to be valued and appreciated by the people I've worked with this past season. I've been to the West to the sands of the sea, and here in Kentucky I've been down to the rolling hills in Bowling Green. Fall looks as if I will be just as busy. Indeed I will be performing the marriage ceremony for a dear friend. I will be passing the munay-ki rites onto more people (thanks Vicki Jo! ), teaching with Leslie about the faeries again, teaching a class on runes, and I will be heading to Columbus Ohio to teach a workshop and do private sessions. I've gotten to work with some lovely people just because I love to play in the energy of miracles and magic. It helps to not be stingy with your talents. Don't keep your gifts all bottled up to only bring out at special occasions, share them and you will be surprised how often people will wish to honor you by paying you for your time and efforts. I will keep following the breadcrumbs down my personal medicine road. I hope to encounter you on the way in perfect grace in a gentle way. A week ago tropical storm Bonnie was moving through the Gulf of Mexico so we at the retreat center took a journey to see our weather teachers and allies. We got to talk to the spirit of the storm and see if it would agree to change course or dissipate. Bonnie was quite willing to talk and agreed to move out of the Gulf going southeast. In the journey I saw her moving to become rain in Africa. Sadly I didn't follow through on checking the international weather. 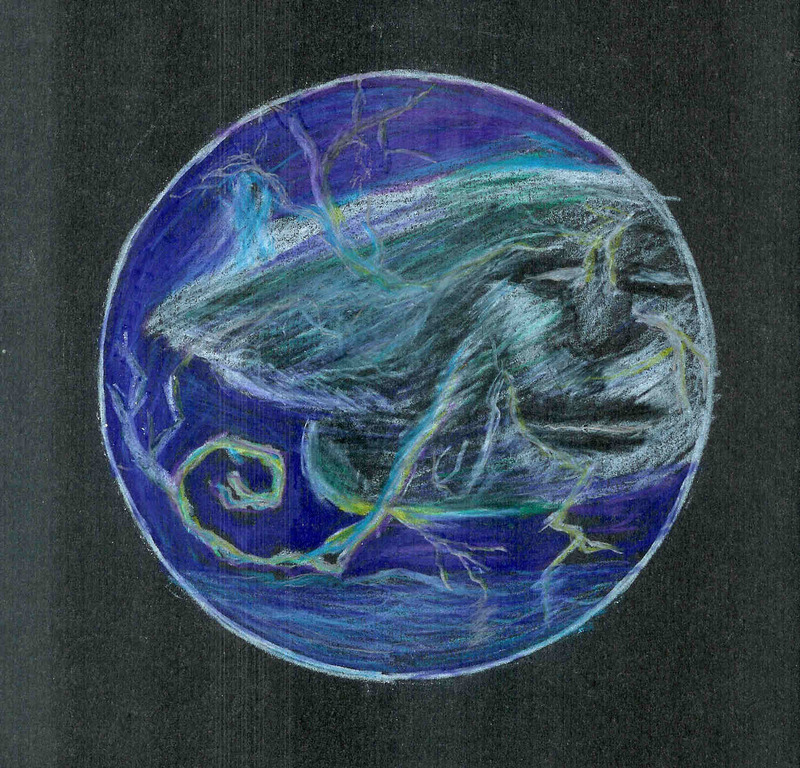 As with all dealings with weather something must be given and Bonnie wanted a mandala made of her storm. So I am posting it here. Dear imaginary readers...I say this because I am not sure if anyone ever reads these posts. Still another message in a digital bottle is being put out to electronic sea of Internet consciousness. With all this virtual information and interconnected suspended thought I wanted to comment on something a bit more solid...food. If any of you have been paying attention to the quality of food in most restaurants (not all but think chain restaurants) you will have noticed a decline in it. I don't mean the meat is spoiled and I am not naming any names (if there are imaginary readers there are also imaginary lawyers). What I mean is the glut of food that is not food. It looks like food, smells somewhat like food, it may have some taste similar to food, but it is not food. It is a mix of food products and chemical preservatives, colorants, and flavor enhancements and substitutes. It has calories (usually too many for the weight conscious), but lacks nutrients and many of its chemical properties have not been sufficiently researched as safe. It is odd when you are made to feel that you are a food snob when what you want is something that is real. Something that wasn't prepared in a factory, doused with chemicals, frozen shipped across the country and then heated up in a steam tray or broiler and served like it was actually prepared in the kitchen. I hereby refuse to eat anything that isn't food from this point forward, as I am on day 3 of gastric upset from eating out on Thursday night. It is true that you can raise the energy of what you eat by blessing it. It is true that there are ways to filter out the toxins energetically. It is true that you can redesign your energy so that anything that you consume only serves you. However once you do that usually there isn't much left to nourish you. Calorically speaking food like substances provide fuel, but they don't replenish nutrients and they don't foster a relationship with the land. When I bless real food made by myself or those who care for me I can feel the field of its chi quite strongly, and I know it will strengthen me. I suggest you try an experiment bless all the food you eat , and before you take the first bite try to sense with your hand how big the energy field of the food is. Do this with something you've prepared. Do this with something that's been grown in your (or a friend's) garden. Do this at restaurants. When you buy groceries and are choosing between 2 brands test the chi field of each item. When we put something of substance in ourselves we heal ourselves and thus the world. Eating locally grown food and organic food helps us to become clearer in our energies and it helps support our community of farmers. It is the season of growth and vegetation so there are many good things to taste. Give yourself something real that is the product of someone's hands. Today was the very first didgeridoo workshop held here in Louisville. As many of you who have sat in circle with me know, I've had a didgeridoo for several years and I love to play it for gatherings. However, I've never really had much instruction and hadn't ever mastered circular breathing or animal calls through the didge. So together with Linda Roe, we coordinated to bring up didgeridoo expert Michael Bacon (he will deny being an expert but that is what I am calling him). We had 2 full workshops starting this morning at 9. We broke for lunch after noon and then the second class began around 1:30. Many of us were quite out of breath after several hours of making quite ridiculous and indigestion like sounds on our didges. There were several times when not just myself, but most of the room broke out into laughter as our drones fell flat and turned into something sounding more like a bathroom noise. Okay I will type it...we made sounds like loud farts. LOL! I had considered just taking the intermediate workshop since I've had my didge for several years, but I am so glad that I took the beginner's workshop too. I have been apparently been droning in a way that is not quite correct. So next time (and yes there will be a next time) I'd encourage any didge enthusiasts to take both classes. Apart from fart jokes which none of us voiced, but we were all thinking, Michael also demonstrated his healing modality which combined reiki with the spirit of the didgeridoo. Many of the participants felt the energy move up their spine and out the crown of their head. I felt it moving up, but it swirled in my heart and sort of radiated out from my face and circled the crown. It was a very visceral feeling of warmth and vibration combined with the awareness of the subtle energies moving within me. Personally it sparked several artistic ideas with me and I have a list of tasks to now bring new creations to life. One of the more memorable moments was a question Linda asked Michael about the sound of the didgeridoo. If the drum is the heart beat of the mother earth what is the sound of the didgeridoo? Barbara Bloecher (also in attendance) always says that the sound of the didgeridoo is the sound of creation. However I had a flash of another way to describe the sound. I hear the didgeridoo as the echo of the dreamtime. Well it has been a week since we held our workshop for communicating with Faeries Devas and Nature Spirits. This year we held a day long workshop. I got my own special instructions to channel Faery for the whole workshop. It was interesting to channel all day long and hold the energy of the Green Realm for the workshop. In many ways I think I benefited from the interaction as much as our participants did. My energies have been running in a renewed way. The weather this week has certainly helped in that regard though. We've been blessed with pleasant low humidity days that we didn't get many of this June. Practicing tai chi outside and taking walks in the sunlight as well as the moonlight have seemed to soften my energies. Touching faery always seems to bring up the appreciation of the little things in life. From a the caress of the wind, to the spill of light upon the ground, to the green of the leaves in high summer. We are treading through the season of light and plenty now. All around us the natural world is suffuse in life and abundance. We need to partake of its light and warmth while we can. The pages of the seasons will turn before we know it, already the days shortening again. However beauty is to be found in every season. If there is one thing that the fair folk have taught me is that their is joy and worth in every single season of life. We often don't realize what we have in one period of our life until we have moved on to the next. The movement of seasons each year gives us the opportunity to appreciate where we are in the greater cycle of nature, and if we can harmonize with them perhaps we can learn do so with our own personal cycle. It is something to think of whether your are in the spring of childhood, the summer of youth, the fall of maturity, or the winter of age there is beauty and worth to be found. For now make use of the blessed season of summer light. So I've come to the end of the free weight trial and I will be posting a new youtube video about it soon. Wish I could say that there was something I learned that will be "the way" I do sessions about weight. The thing I have learned is that sessions about weight are the same as any other session in that they are all different for everybody. The responses thus far have been glowing and I have reports in from the field that transformations and healings in completely different areas of a client's life has accompanied any food issues. It has been lovely in a way to connect with new people and just this week I have accomplished my goal of having contacts in all the time zones in the continental United States. I haven't reached Hawaii yet. I don't know if my phone plan covers that. I'll have to ask next time I'm in the mobile store. Well tomorrow is Beltane and that means today is a baking day for me. Tonight is a travelling day for our good neighbors. It also marks the first time that I will be baking for the Winter court and Summer court. In the midst of that I will also be ordering and designing new business cards in anticipation of my upcoming trip to the west coast. It is my first paid business trip and I am looking forward to it and to many more over the next few years. Sometime I'd like to do a cruise where I offer my services and get the cruise for free (plus a little spending money for the trip). If you know anyone who can do that for me please connect them to me. It is interesting to hear the varied reactions to the people around me who can't imagine me going off on my own. Of course the secret is I never do anything alone. Trust me if all my help were in the flesh we'd need several rows of the aircraft reserved. So onto baking, designing, and of course the global vigil fire I will be attending. Sorry I've not been posting. I have been overwhelmed by responses for the weight management sessions. So far just the feedback from the first sessions with my participants has been very positive. I am so glad I'm doing this even though it has turned my schedule on its ear. People have told me that their entire relationship with food has changed in an effortless way. I like that. Conscious eating has many benefits beyond our own health. I find that when I am more conscious of what I want to put in my body those effects ripple outward into the marketplace and reward food producers that are more responsible in how they treat the world we live in. I'm lucky to have a friend with a farm who raises chickens. I invite all of you to make friends with farmers so that you can taste what real farm fresh eggs taste like. This spring has been touted as the worst allergy in the past 15 years. That said I'm doing pretty well considering. If nothing else it makes us all so grateful to those rainy days that cleanse the air and bring in those lovely charged ions that make the outside so alive with portent. The air after a good thunderstorm is like a gift from the sky. Bless the rain, bless the sun when it shines. Say hello to wind as it wafts through the trees and your hair. Bless the new leaves on the trees and the birds that are singing so much now. If you see a crow say, "Hello cousin." It is good to feel that nature is our family, because in a very tangible sense it is. Love it and sing it into balance beginning within yourself. That is what human beings can become a conduit for the grace and harmony in creation. It's been almost a week since I've had my site up and running. Already I have had e-mail responses. I quite naively posted on the matrix energetics messageboard that I was doing weight loss trials for a few people for free. The last few days I have been wading through e-mails selecting the ones that would be the participants. The selection process is done and I have scheduled the sessions. I am gonna be one busy bee for the rest of the month. Leslie and I also gave a talk at the Center for Integrative Health this Tuesday on our Matrix Energetics Seminar experience. It was very well attended and we got to do a little play. I did a live money miracle download for the attendees. On top of that out of the blue an old friend and client called me and wants to fly me out to LA and do some work for them. I'm excited I haven't flown in years. So I am getting to do what I love and people are clamoring for it. Sometimes the change happens so fast, and other times is so subtle you don't notice it till much later. In any case I am seizing onto any opportunities I can right now, and I am excited to see what this brave new world has to offer. I'm so excited I just received my first donation via the blog from one of my youtube viewers. I've been focusing most of my effort on youtube rather than the blog the past few months. If you haven't checked out my videos yet click on the link. 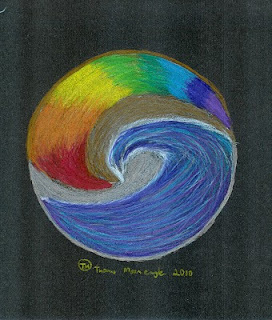 I've got some samples of my energy work and play, plus a few talks and tidbits. This donation is a big step for me into making my dream of doing this work (or play for all you matrix lovers) into a tangible reality. The money miracle video I posted a month ago seems to have really struck a chord with everyone. Go treat yourself and watch the video and others. Make your dreams real. It's been long hard winter. I'm glad to say we weathered the winter snow and ice well here. We had talked with the weather spirits at the start of the season and were told there would be several major weather events and they were astoundingly accurate each time we checked in...much more accurate than the meteorologists. The spirit of winter talked about it being a time of inner growth and opportunity, and it has been. My youtube channel has become more popular, and I am currently working on getting my first professional website together. When completed I will have an online shopping cart for my services. It has been a busy time moving between the worlds and mediating between spirits and this realm now spring has sprung and the outdoors is calling to my heart as well. It seems there just isn't enough time to keep up with everything. If you've been tuned in like I have the past season you have been coming up against your own inner blocks. All the challenges now that we are facing are here to prepare us to explode with growth and joy.